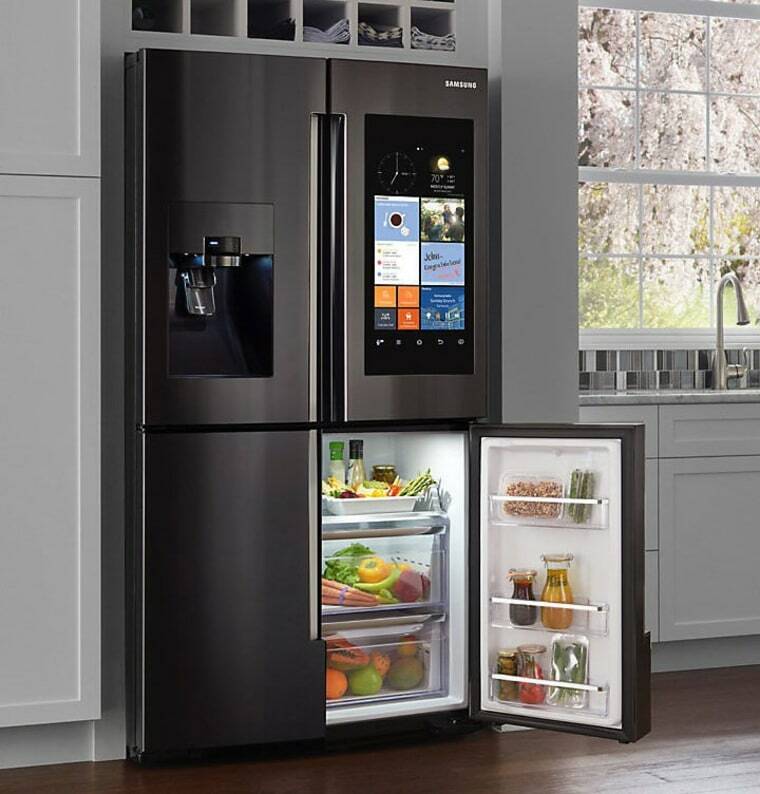 Far from just a place to keep your veggies fresh, many modern fridges are now gadgets on the level of an iPhone or smart speaker. Here’s what’s new in the world of fridges. The humble fridge has come a long way in the past 10 or so years. Walk into your local appliance retailer now and you’ll be greeted with a seemingly endless range of so-called ‘smart fridges’ competing for your attention – and your money. You’ve almost certainly seen the Samsung smart fridge with a built-in screen, but that’s only the tip of the iceberg (no pun intended) for new fridge technologies. However, are any of these technologies actually worth your time? This article will explore some of the latest advances. ActiveSmart Foodcare understands how you use your fridge and adjusts things like temperature, airflow and humidity inside the fridge. You’ve got a smartphone in your pocket, a tablet in the living room and a laptop in the office – why not add some smarts to your fridge too? Getting smart with your fridge could make your life much easier. The Samsung Family Hub, for example, packs in a number of useful technologies. Built-in cameras mean you can see what’s in your fridge even if you’re out and about, while a massive screen can display recipes, a family calendar, music and even weather information. Need to go shopping, but don't feel like leaving the house? You can order groceries online with the Family Hub. LG’s Signature French Door Fridge will flash a ‘Door Open’ light projection on the floor – just put your foot under the light to open the door hands-free. If you go for one of the latest Panasonic fridges, you’ll have access to an LED touch panel which gives you temperature controls and information on how the fridge is operating. Certain Electrolux fridges have a holiday mode which stops strange smells from forming when closed and unoccupied for a long period. Compare the design of an iconic fridge of the 1950s to a model available now – it’s clear a lot has changed. Beyond just the form, most new models feature much more functional designs. Fridges with glass panels aren’t common, but after seeing LG’s fridge you may wonder why this is. The ‘InstaView’ system allows you to see what’s inside, just by knocking on the front glass planel. It’s an excellent way of reducing cold air loss and keeping food fresh. 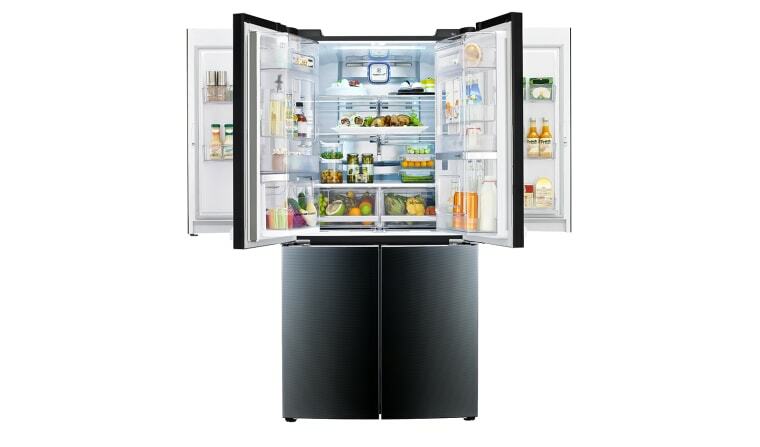 LG also offers the world's first Dual Door-in-door fridge. Keeping more frequently used food and drinks on the outer doors minimises cold-air loss. It's also another great way of combatting clutter. Certain fridge models feature stainless steel inside, both for looks and to keep food as cool as possible. Miele fridges offer various user interfaces – meaning you can choose whichever method fits you best. 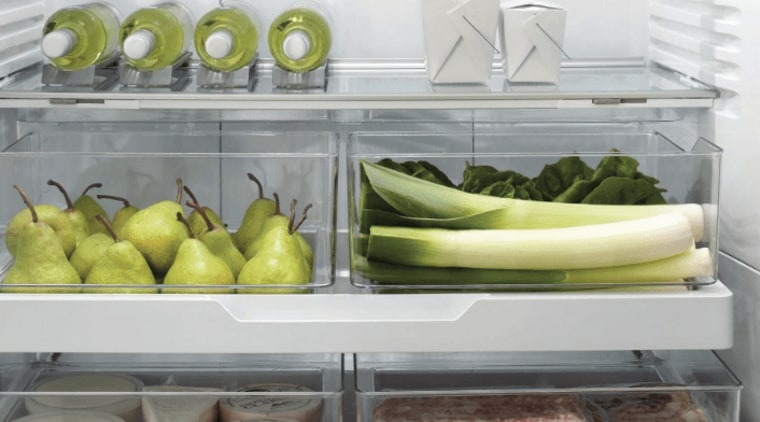 Isolated compartments with the ability to keep to different temperatures means it’s easy to keep food fresh. One of the new Panasonic fridges features a standard fridge compartment at 4C, a vegetable case at 6C and a spot for meat and fish at -3C. If you opt for a Fisher and Paykel, you'll gain access to a smart system which learns your usage habits and adjusts cooling accordingly. Certain LG fridges release cold air automatically from front and rear ducts to ensure each compartment is cooled appropriately. Forgot to take the meat out of the freezer? It's not an issue with Bosch – their NoFrost freezers stop ice from forming. Dinner is saved! You can’t buy a fridge in 2018 without it having some energy saving features. 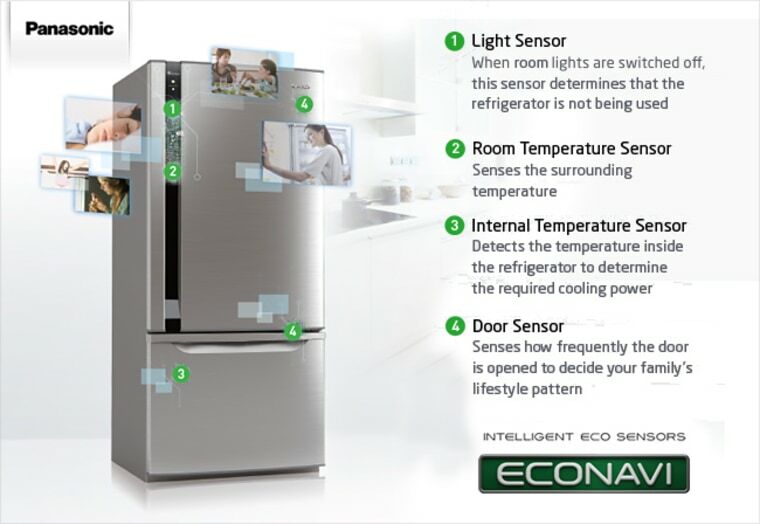 Smart sensors in modern fridges, such as Panasonic's econavi constantly monitor the internal temperatures, managing the cooling to maximise efficiency. Certain new smart fridges will also actively analyse how you use the fridge and adjust energy output accordingly. If you’re in the market for an energy saving fridge, just make sure to look for high energy star ratings.